Woodwinds Health Campus opened its 86-bed hospital in August 2000. 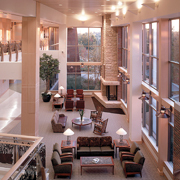 Located on 30 acres of pristine wetlands in Woodbury, MN, it is the only hospital in the southeast metro area. Woodwinds provides convenient, comprehensive and quality health care for the community. The Woodwinds campus includes full-service hospital and emergency care, outpatient services, education and community resource centers. The adjacent Oak Center houses HealthEast Optimum Rehabilitation , and Children's Hospitals Pediatric Specialty Clinic and Development and Rehabilitation Services. The Birch Center includes doctors' offices, the HealthEast Woodbury Clinic and osteoporosis care. Integrative therapies are provided through the Natural Care Center.